Description: Duluth & Northern Minnesota 14 pounds across a crossing eastbound on the WC on the return leg of a excursion. Description: Duluth South Shore and Atlantic division of Soo Line Historical and Technical Society sponsored a passenger special. 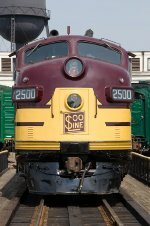 Soo Line 2500(F-7A) lead locomotive Erie Mining 4211 trailing locomotive. Description: No. 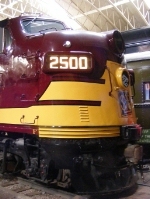 2500 was built by General Motors Electro-Motive Division in November, 1949, as a demonstrator unit. It was then taken on a sales promotion tour. 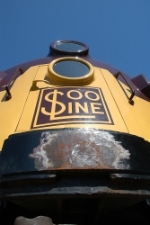 Soo Line was so impressed that it purchased the demonstrator unit. The No. 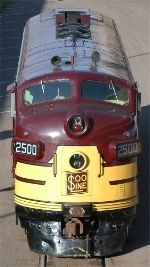 2500 pulled The Laker passenger train for the Soo Line (now CP Rail) from Duluth to southern Wisconsin and Chicago. Description: possibly B&O yard near central station. Note C&O and B&O units in background. 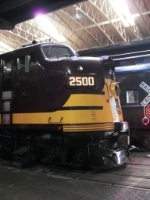 Description: Soo 2500 with passenger cars was spotted near the roundhouse at Proctor Yard. Description: At Steve Glischinski's railfan weekend in Duluth MN. Note the Griswold signal. Title: Working Soo Line F7 at Duluth train musuem. Title: Ride classic passenger trains from Duluth MN to Two Harbors in Duluth MN. Title: Ride in vintage trains in Duluth MN year round.